I’m a self-proclaimed pen nerd. I love pens, especially if it’s a Sharpie or a smooth liquid gel ink pen. I was that kid that loved her multi-colored pen, the one that had at least four colors. Once I got my hands on the one that had ten colors I coveted it like it was the Hope Diamond. OK, I admit that as an adult I treated myself to a 10-color pen. And I’m proud to say I used all 10 colors at once to write my name in a loopy style over and over again. I think I even sent a handwritten internal memo or two that way. But it was probably to my friends and not the CEO. Though, I think he might have liked a rainbow colored note to liven things up. The only other thing that matches my pen nerdom is my fascination with kitchen gadgets and kitchen ware. My version of Toys-R-Us are stores like Williams Sonoma – or even better – a restaurant supply store. One such store I used to go to on my lunch breaks was in Chinatown. I’m pretty sure I had the goofiest look of happiness and awe on my face when I would go up and down the narrow aisles. Did I mention that this store was for Chinese and Japanese restaurants? Heaven! I can’t even tell you how many times I wanted to walk out of there with a pu-pu platter tray, complete with its own little hibachi, and a sushi boat. I didn’t have time to go to a store (i.e. it was raining and I didn’t feel like going out) so I went on Amazon and ordered a couple of Nordic Ware half baking sheets. When it came in the mail and I saw how beautiful they were, I was that happy, goofy person in the restaurant supply store all over again – with a 10-color pen! Who knew that shiny, brand new baking sheets, that looked like Ina’s, would make me so happy? 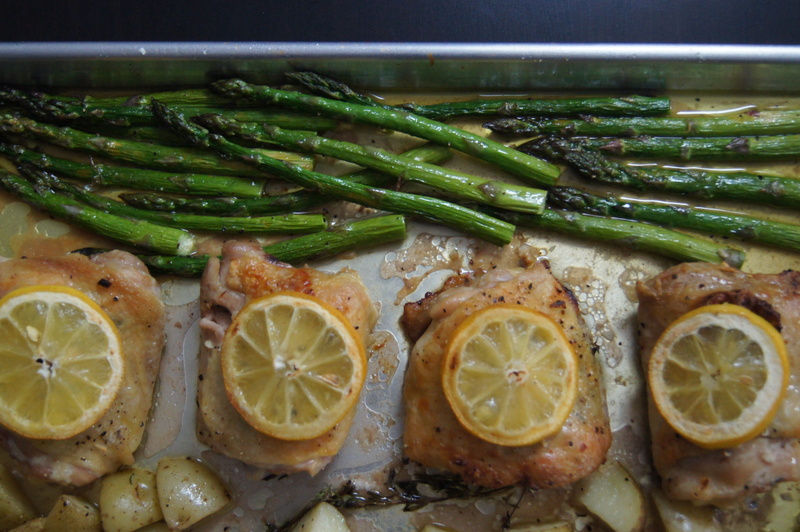 And then when I made this sheet pan dinner with them I was incredibly happy. I love it when a recipe – especially if it’s a weeknight dinner – comes together easily AND has a lot of flavor. Even better, this recipe can be assembled ahead of time and when you’re ready for dinner you can just pop the sheet pan in oven. You have time to relax – or catch up on The Real Housewives of New Jersey (I am so behind) – until dinner is ready. What I also love about this recipe is that it tastes and smells like Sunday dinner, but without all the time spent on prepping and roasting. I just love the idea of making a complete dinner on a sheet pan and I’m sure this will be the first of many sheet pan dinners that I’ll be making and sharing with you – and geeking out on. Pour 2 Tablespoons olive oil onto a rimmed baking sheet and brush to coat the entire surface of the sheet (you can also use a paper towel instead of a brush). Place thyme sprigs on one side of the baking sheet. Spread potatoes on top and sprinkle with 1 to 1-½ teaspoons salt and ¼ teaspoon pepper. Gently toss to coat. Sprinkle both sides of chicken with salt and pepper. Take about a tablespoon of garlic butter and rub both sides of chicken, the butter doesn’t have to coat the chicken. Slide fingers under skin, loosening a little, and spread garlic butter under skin. Arrange chicken on baking sheet and sprinkle with salt and pepper. If you have extra butter, top each thigh with a pat of garlic butter. Top each chicken thigh with a lemon slice. Make sure to leave space for the asparagus. 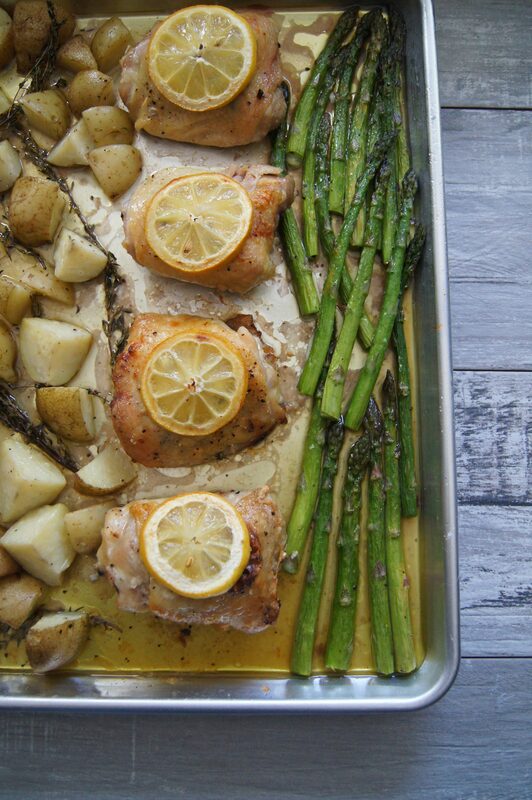 Place baking sheet in oven and roast chicken and potatoes for 20-25 minutes. 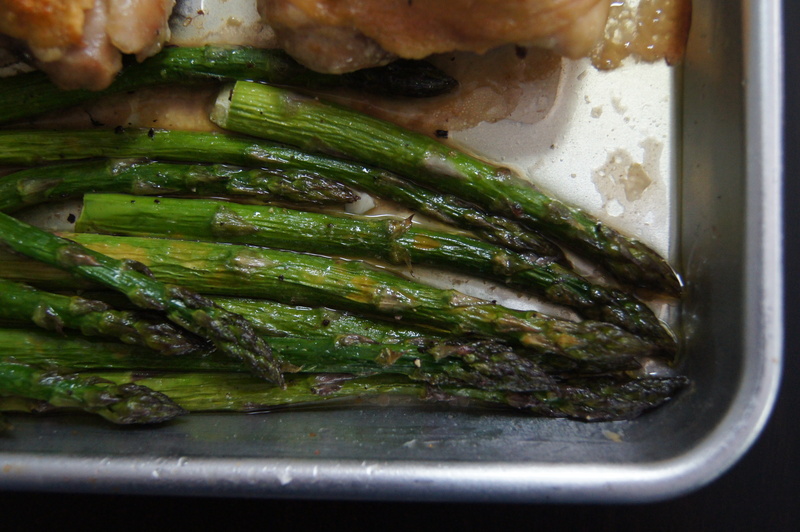 While chicken is roasting, toss asparagus in remaining 1 Tablespoon of olive oil, salt and pepper. After the chicken has roasted for 20-25 minutes, add the asparagus to the baking sheet and continue roasting for 10 more minutes, or until the chicken is cooked through and the potatoes are can be easily pierced with the tip of a knife. Remove baking sheet from oven and turn the broiler to high. Cover the potatoes and asparagus with aluminum foil. 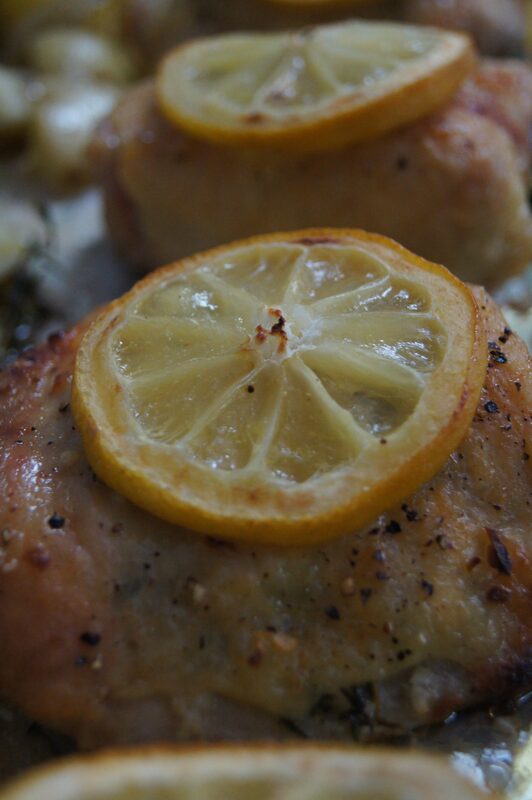 Remove the lemon slices from the chicken and set aside. Return the baking sheet to the oven and broil until the chicken skin gets brown and crispy, 1-½ to 2 minutes, or until desired crispness. When done broiling, top chicken with lemon slices. Serve immediately and enjoy.